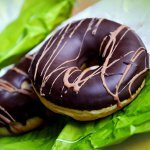 National Doughnut Day, also spelled as National Donut Day, is an informal American holiday celebrated on the first Friday in June. It was created by the Salvation Army in 1938. During World War I, the Salvation Army sent about 250 volunteers to France. They established “huts”, special social centers that served baked goods, provided soldiers with stamps and writing supplies, and offered a clothes-mending service. As it was difficult to provide freshly baked goods near the front lines, two volunteers (Helen Purviance and Margaret Sheldon) came up with the idea of serving doughnuts instead. Soon, the women who served complementary doughnuts and coffee to U. S. servicemen became known as “Doughnut Dollies” or “Lassies”. In 1938, the Salvation Army created National Doughnut Day to honor the volunteers who served doughnuts to soldiers during the First World War. In some cities across the United States, the holiday is still a fundraiser for the Salvation Army. On National Doughnut Day, some doughnut stores offer one free doughnut to every customer with no purchase necessary. Free doughnuts are typically offered to solicit donations for the Salvation Army or for another charity.